Definition at line 28 of file CFluxScore.h. Definition at line 36 of file CFluxScore.cpp. Definition at line 38 of file CFluxScore.cpp. 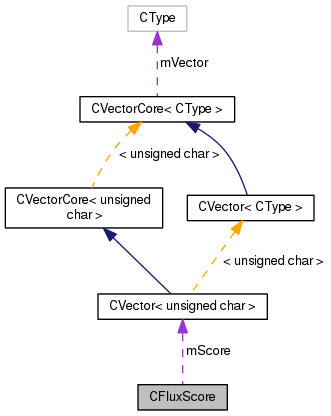 References CVectorCore< CType >::array(), CONSTRUCTOR_TRACE, mScore, and CVector< CType >::resize(). 45 // Size the scoring vector. 53 // Set the bits to 1 if the corresponding fluxMode coefficient is non zero. 67 // Do the same for the remaining fluxMode coefficients. Definition at line 85 of file CFluxScore.cpp. Definition at line 87 of file CFluxScore.cpp. References CVectorCore< CType >::array(), mScore, and CVectorCore< CType >::size(). Definition at line 100 of file CFluxScore.cpp. Definition at line 36 of file CFluxScore.h. Referenced by CFluxScore(), operator<(), and operator<<().